Sorich Ranch Park hiking trails lead off in many directions and vary in degree of effort required. 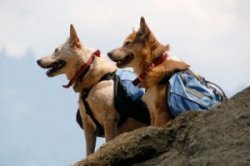 No leash is required except on two small trails - Sorich Park Trail & Dan Abraham Trail. No water is available along the trails, so be sure and bring plenty of water for you and your dog. Deep in the eastern Santa Monica Mountains in the City of Los Angeles, Westridge-Canyonback Park provides more than 1,500 acres of open space bordered by upper Mandeville Canyon, Sullivan Canyon, Mission Canyon, and San Vicente Mountain Park. Permitting off-leash dog hiking under their owner’s immediate control.